On 21-22 February 2019, the German National Academy of Sciences Leopoldina and the Leibniz Association organised Forum Future Europe. The event was attended by top-level policy makers of the science systems from Germany and the EU13 (Bulgaria, Croatia, Cyprus, the Czech Republic, Estonia, Hungary, Latvia, Lithuania, Malta, Poland, Romania, Slovakia, and Slovenia). 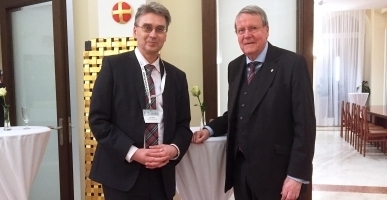 Lithuania was represented by Prof. Jūras Banys, President of the Lithuanian Academy of Sciences, Prof. Artūras Žukauskas, Rector of Vilnius University and full member of the Lithuanian Academy of Sciences, and Professor and Academy member Saulius Klimašauskas. Forum participants included representatives of the Directorate-General for Research and Innovation and members of the European Parliament. The discussion revolved around the future of European research and innovation funding (Framework Programme ‘Horizon Europe’) and the main directions of scientific research. The debate also focused on how to deeper involve EU13 countries in research and seek conducting equally relevant and globally competitive research across all regions of Europe. In addition, the forum discussed measures and ways for practical application of scientific knowledge and its inclusion into the processes shaping the future of Europe. This is of crucial importance when managing the challenges that affect the Union and for designing the new EU strategic agenda to be adopted at the summit in Romania on 9 May 2019. The discussion focused on two major topics: (1) the future of the EU and of the European continent: providing answers from the entire repertoire of science towards a ‘Future Europe Agenda’, and (2) the future of the European Research Area and European Higher Education Area in terms of enhancing participation in EU funding, creating comparable chances, and overcoming structural deficits. A joint ‘Forum Future Europe Communiqué’ summarised the discussions and conclusions reached at Forum Future Europe. The Communiqué was distributed to decision-makers at the European Parliament and the European Commission and in EU member-states.